Results from the 2017 ISTEP exam remain nearly unchanged compared to last year after an overhaul of the standardized test caused pass rates to plummet two years ago. Only about half of Hoosier students in grades three through eight passed both parts of the required math and English assessment. The state Department of Education released results today. For the Spring 2017 test, 51.5 percent of students passed both parts. That’s a fraction of a percent less from the previous year. State Superintendent Jennifer McCormick described the results as flatlined. The high-stakes exam counts toward teacher evaluations and school accountability A-F grades. It’s also used to assess student proficiency on the state’s academic standards. In 2015, after new state English and mathematics standards were adopted, the ISTEP exam changed. It became more interactive — students could be asked to highlight passages of text on a computer screen — or show how they reach the answer to a math problem. Fewer of the problems that plagued the ISTEP in recent years were reported last spring, after the overhaul. But by that time lawmakers had already decided to replace the test. The current version of the ISTEP exam will be given again, for the final time, this coming spring. A new version of the standardized test called ILEARN is under development for 2019. It is intended to be shorter and quicker to grade. 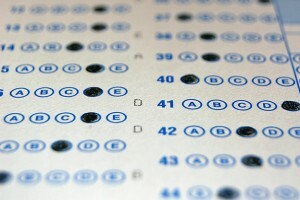 It will also be adaptive — completely online with test questions that change as a student gets an answer right or wrong. Saint Wendel School, a small private Catholic school in Wadesville that accepts state-funded vouchers, earned the highest score in the state for students passing both math and English, 96.5 percent. Northpoint Elementary School, of the Penn-Harris-Madison School Corp. in Granger, had the second highest score at 94.8 percent. Brownsburg Community Schools, a corporation of fewer than 9,000 students northwest of Indianapolis, had the highest pass rate of all school districts this year at 83.1 percent. Carmel Clay Schools in Carmel had the second highest rate for a traditional public school district at 80.7 percent. Indianapolis Public Schools had the lowest overall school corporation pass rate, at 24.5 percent, a slight decrease from last year. Testing company Pearson has administered the ISTEP the past two years under a $38 million with the state.